Just another day in the Airblaster office. Airblaster photo. Fun can be a loaded word–it can be easy to think that anything involving snowboarding is as inherently fun as the activity itself–but the truth is that most people in the industry work incredibly hard to make the products that we as snowboarder get to enjoy. Day in and day out they are in the trenches grinding, so we can have maximum fulfillment while sliding on snow. Jesse Grandkoski is one of those people. 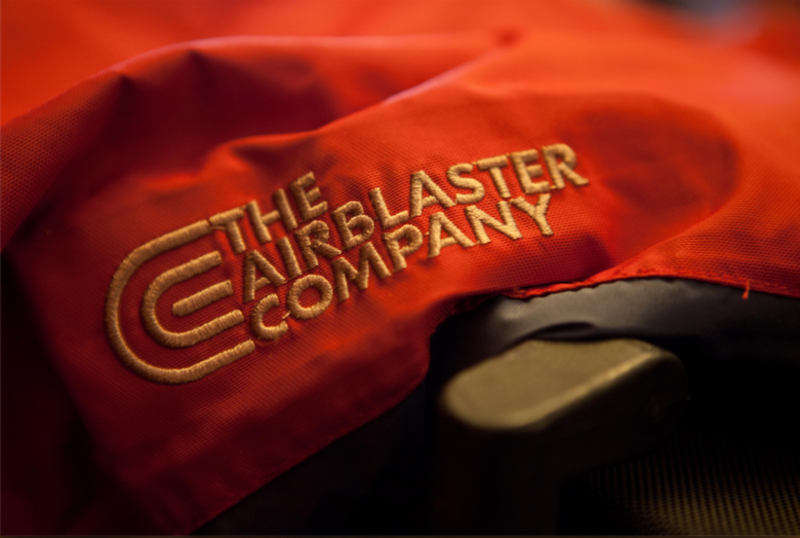 His company, Airblaster, has been producing outerwear and accessories for over 15 years with a distinct focus on, well, fun: Airblaster invented the original ninja suit, the one-piece long underwear suits that are now ubiquitous at hills across the country. When he and friends Travis Parker and Paul Miller started the brand in 2002 they had no way of predicting the wild ride that owning an outerwear company would take them on. Since its inception Airblaster has held steadfast to its ideals of not taking snowboarding too seriously, even when dealing with the challenges of running a business. We got on the phone with Grandkoski to talk about what it was like growing up as a snowboarder in Montana, his longtime friendship with Travis Parker, and what he’s learned about being an entrepreneur in an ever changing industry. Jesse Grandkoski: Olney, Montana. It’s in the sticks about 20 miles north of Whitefish. My boundaries were pretty broad, literally: I couldn’t go across the highway in one direction, nor the river in the other direction. I probably had about a 5 mile radius to roam, ride bikes, catch critters, and make trouble with the friends. And how did you get into snowboarding? What initially attracted you to sliding sideways? JG: I grew up cross-country skiing, which I really appreciate. Around age 12 or 13, it got more competitive with racing and I realized that I was interested in a more freestyle route. Cross-country skis are good for some things, but catching air is not one of them. I tried and I had some good scorpions. At the same time my family moved into Whitefish and I had a few friends that snowboarded. I dove in, found a good deal of freedom, and never looked back. In the late ‘80s into the early ‘90s snowboarding was pretty insular, what was the scene in Montana like at that time? JG: It seemed like there were only about 10 snowboarders up at Big Mountain (now known as Whitefish Mountain Resort) when I started. There were probably a lot more, but it was small. Gear was still primitive or nonexistent. I wore my dad’s Sorels and duct taped those boots like they were the sprained ankle of an NBA star. Every day I’d cut the duct tape off at the end of the day. It was very effective in preventing heel lift. More importantly every other snowboarder was another conversation waiting to happen, more knowledge to be gained, and likely a new friend to shred with. It’s really cool to be involved in an activity when it is at that level: There is a ton of energy, minimal attitude, and there wasn’t much of a scene. Around this time you met Travis Parker and started shredding Whitefish together. 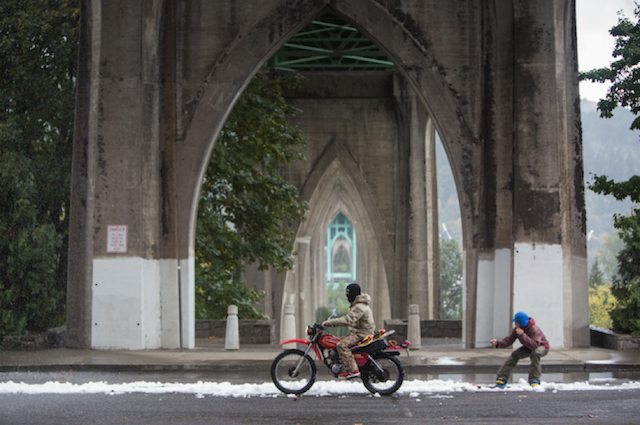 How did your friendship with Travis impact your snowboarding and that time in your life? JG: Travis and I met and we quickly became great friends. He had moved up from Texas, and we started snowboarding that same year. We basically learned how to snowboard together. Snowboarding definitely was a big part of our friendship, but more importantly we share a similar sense of humor. We both really value and invest in funny business. During a time when most kids our age were getting drunk at keggers in the woods, we’d make our own entertainment. I mean, we’d go to the keggers, prank people, and try to keep from getting shot. Search out dance parties and cut a rug. Pretty good clean entertainment. Travis Parker has played every role from pro to founder at the Airblaster Corp. Airblaster photo. I saw that you went straight to college after high school and Travis moved to Colorado to chase the pro snowboarder dream. Was it hard to stay in college while your best buddy was living the full-time snowboard lifestyle? JG: I’ve always been a pretty driven person. I can be pretty intense and stubborn, which is a double-edged sword. It wasn’t really tough to stay in college while Travis and our friend Andrew Crawford were putting all their eggs into snowboarding. I was the valedictorian of my high school, so I had the opportunity to get some scholarship and financial aid and go to a legit school. I was told that this was an opportunity not to be missed, and while I’m not sure that I completely agree in hindsight, I don’t regret doing that. Trying to reconnect with my buddies, and realizing that snowboarding had become this different thing to them was difficult. Back when we were growing up, it was 100 percent freedom for us. We tried really hard and we critiqued each other’s style in support of progression, but it was the opposite of a job. In the four years I spent at college, some of my best friends had made snowboarding their job. And as much as being a pro snowboarder is perceived to be a really awesome job–and it definitely can be with the right attitude and strategy–it’s still a job. So I struggled with that for a little while. First world problems. I wanted to keep progressing in snowboarding and riding at a higher level, but a lot of times doing the things that it took to get to that next level of pro boarding didn’t seem that fun or rewarding to me. It’s different for everyone, but I always felt like I had one foot on the boat and one foot on the dock. Wanting to snowboard more, but not wanting to squeeze through the holes that I perceived that I had to squeeze through to make that happen. 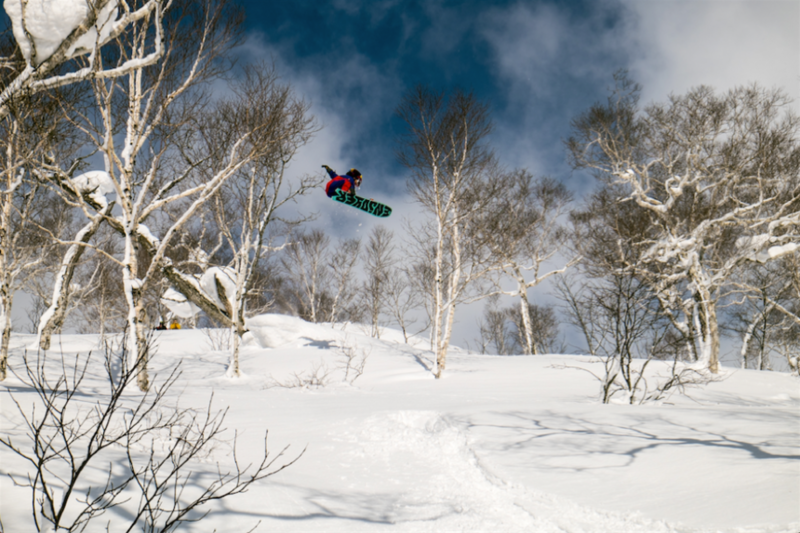 Airblaster team jester Tim Eddy goes big in Japan. Airblaster photo. How did the concept for Airblaster first come up? JG: For me, it was about being able to pursue snowboarding as a viable lifestyle and finding enough of a commercial angle to pay my student debt, without sacrificing the freedom that I had found in the sport. I needed to keep that freedom or leave and find it somewhere else. I think that all three of us truly loved snowboarding, but were each a bit burned out or disillusioned about it in different ways. However, we were not ready to entirely give it up. For me, a big part of the founding of Airblaster was making the decision not to let all the BS that I perceived in snowboarding to push me away from this activity that I love so much. I decided that I wanted to communicate what snowboarding meant to me, share this perspective, and this set of ideals. I felt like someone needed to share this perspective, that snowboarding is about friends, freedom, and fun and not cool vibes, sponsorship, or some strange hierarchy based on freestyle credentials. We had no idea what products we were going to make. At the end of the first meeting, we decided that our short term goal was three t-shirts and a beer-cuzzi. What was that first year of production like? JG: Portland, Oregon, baby. We started making outerwear in a place where there was basically no equipment, know-how, tools, industry, or sewing shops to make outerwear. I found a place in Portland to buy overstock outdoor fabrics. I found a converter in LA to laminate Hypalon to the backside of the fabric. I found a guy–Mike Hung–to sew it up. Hired this girl Jen to make the patterns; everything was from scratch. We had no experience whatsoever. It’s cool to see how far we’ve come in our knowledge and execution of outerwear. I’m proud of that and it is cool to remember that it all came from scratch. Airblaster has been about good times and good gear since day one. Airblaster photo. I’m sure there was a steep learning curve, but after the first season was it clear you could actually build a successful company? JG: It was about six months of freeform idea blasting, fantasy, visualization, and jokes, then we realized that we actually had to make and deliver something. The rest has been extremely difficult. Since our launch it has been 15 years of the steepest learning curve you could imagine. I’ve never done anything even close to as difficult. Luckily there are benefits and rewards to doing what we do, the biggest of which is hanging out with the community that we’ve created, and realizing that it is 100 percent made up of really great people. I think that is the one part we got right from the beginning. Just work with good people and surround yourself with good people. One of the best things about Airblaster is that the brand direction was and is fun and funny, but was it ever difficult to balance the fun aspect with the stress of running a business? JG: Has it ever NOT been difficult to balance the fun aspect with stress of running a business? I’m still searching for that balance. I think love of a common goal or set of ideals will create that sort of environment. I always joke that people who visit Airblaster expect to be stepping into Willy Wonka’s Chocolate Factory, and it’s never quite that glorious. All we can do is learn and make improvements every day, and keep moving towards making the internal culture match the external culture that Airblaster has created. What is the future of Airblaster in the next 5-10 years? JG: We’re diggin’ in for a steep battle. We have the benefit of having been around for 15 years now, yet we still bring a fresh perspective. We make great outerwear and we’ve got the Ninja Suit. I think we’re going to have to continue to improve our internal organization and execution, while maintaining that spark that got us here. There’s a lot of opportunity, and I’m excited about the next five years, but I don’t anticipate that it’ll be much easier than the last 10. The brand ideals won’t change; it’s about reaching out to make our family bigger. You might find new ways of speaking to different people, but the message doesn’t change. Any big projects that Airblaster is currently working on that we should be on the lookout for? JG: Just wrapped up SKOLF tour and it was insanely fun and entertaining. If you haven’t checked it yet, #SKOLF on Instagram. We basically made a group-play version of S-K-A-T-E (or H-O-R-S-E), by stealing the basic framework of golf and adapting it to snow. It's not as complicated as I just made it sound, if you like snow or golf, you should check it out!